Generally the first major festival of the English year in Sri Dham Mayapur is Sri Krishna Pushya abhishek. 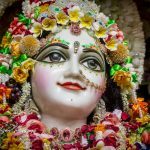 For devotees this is a festival of joy, as every year we get a chance to offer some personal service to our dearest Sri Sri Radha Madhava, and it is truly a glimpse into what it may be like in the spiritual realm. It brings us close to the mood of Sri Vrindavan Dham! 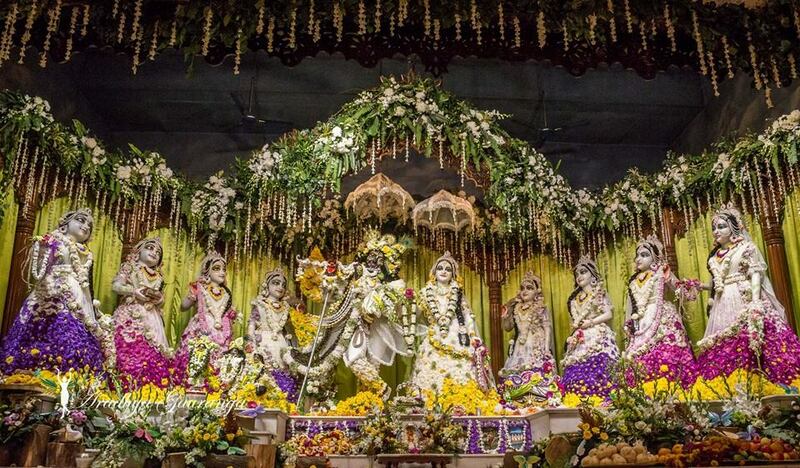 On this day hundreds kilos of fragrant flowers are lovingly prepared by the devotees and offered to Sri Sri Radha Madhava and Ashta Sakhis (the eight gopis) through the most colorful abhishek of flowers! 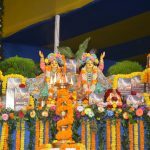 In this period Mayapur is surrounded by the festivals atmosphere because Gaura Purnima is coming soon, together with many others celebrations.The community devotees gather the day before the Pushya abhishek to start the preparations for the upcoming festival. It requires a big endeavour to make the abhishek very successful. More than two hundred devotees participate in the preparation of this unique festival. 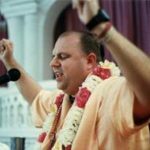 This is a very unique and special opportunity for the community to come together and perform service for the pleasure of Sri Sri Radha Madhava and Ashta Sakhis. astounding dress out of multi-coloured flowers that will be offered to the Deities just after the blissfull Mangala arati. Each year, the flower dress has its own unique design and flower choices. 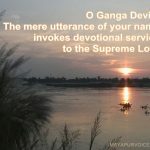 Sri Madhava also has a uniquely special flower outfit which is made and cut to perfectly fit His Tribhanga form, as well as flower jewellery and flower mukut pieces for His turban. Srimati Radhika and the eight Gopis have their own full outfit of a flower skirt, top and veil, complete with flower jewellery from head-to-toe. Last year for the skirts alone, the devotees use over five thousand flowers per skirt! This is exactly what Srila Prabhupada wanted- “pushya abhishek means a ceremony to decorate the Deity profusely with flowers, ornaments, cloths”. 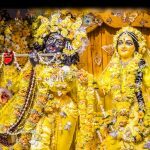 On the day of the Sri Krishna Pushya abhishek a big gathering of devotees eagerly await the blissful darshan of Sri Sri Sri Radha Madhava just after the Mangala arati, to receive their merciful shower of mercy. All the collective efforts and services of the devotees in Sri Mayapur are recorded by the eyes of the Deities, full of compassion and always ready to reciprocate with Their unconditioned mercy. This festival is not to be missed at all! Sri Krishna Pushya Abhishek Ki Jay! Next articleMinimum Income Guarantee – Political masterstroke or Historic blunder? Push for cashless economy post demonetization – Excuse or Necessity? What does the Mexico earthquake tell us?